Posted on October 21, 2014 February 6, 2015 . by Patrick Johnstone. 2 Comments. Allow me to start with the obligatory apology for not writing more frequently. I’m busy. This story in the NewsLeader caught my attention, though, because it demonstrates a failure at many levels. That we would cut down mature trees in our City to make it easier for a few cars to move a few hundred metres to the next traffic constriction is an example of a planning process gone wrong. The City has recently outlined its consultations on an Urban Forest Management Strategy. At the open house last month at Century House (about 300m from where these trees are slated to be removed), staff and consultants talked about how important a healthy tree inventory is to our City – providing shade to reduce energy costs, evapotranspiration to reduce utility costs and improve rainwater quality, noise baffling, light pollution reduction, critical habitat for pollinators and songbirds, etc. etc. At the same time, the city’s tree inventory is being reduced at a faster rate than population growth, and although our current inventory (as percentage of land cover) is similar o other cities in the region, it lags far behind the North American average and the level identified as desirable to receive all of the benefits that healthy urban forest can provide. We don’t yet know where the Urban Forest Management Strategy is going yet, but the goal is pretty clear: lets stop cutting down mature tress for bad reasons, so when we have to cut them down for good reasons, it has less impact, and we don’t have to spend so much replacing them. The story above is an example of cutting down mature trees for bad reasons. 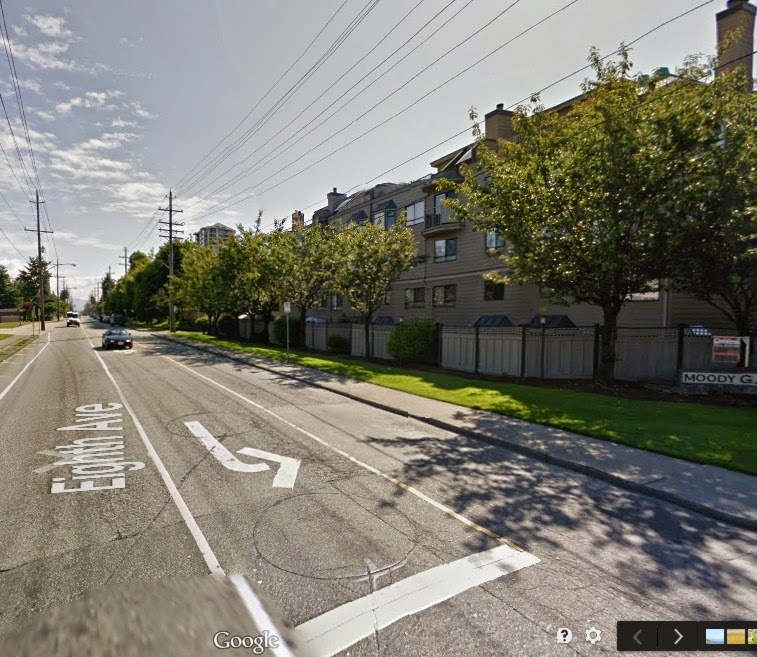 The first-level reason for removing the trees sounds OK – they want to make a bus stop more accessible and functional. I’m all for it, accessibility at that stop is really important, as it is commonly used by seniors to access the nearby Century House and the Massey Theatre, and by students accessing the High School. Constant improvement of our sustainable transportation network is something I have been calling for in my many years on the Advisory Committee for transit, Bicycles and Pedestrians. However, improving the accessibility of this stop does not require the removal of any trees. What does require the removal of the trees is protecting two parking spots and creating the illusion of “getting cars moving”. The current bus stop is at a spot on 8th Avenue where there is only one east-bound lane, the rest of the road width being eaten up by a westbound lane and a south-turning left turn bay. grass to add more asphalt. Google Maps image. One allegation made by the City’s transportation department is that the bus here “holds cars up” and creates congestion, so they want to remove the greenspace of the boulevard to make a “bus stop lane”. This is absurd for two reasons. That bus stop is currently used by the 128 and the C4. The 128 is normally a 30-minute service, but bumps up to 20 minutes during rush hour. The C4 is a half-hour service. That means up to 5 times an hour, for 20 seconds, a bus blocks the lane. A lane that has a stop light that is red for half of every minute 24 hours a day, all day. Today I dropped by the site and noted th 128 was 300 metres east of the bus stop – stopped by the line of cars waiting to get through the light at 6th. Removing the busses completely on this route will do absolutely nothing to reduce the congestion on 8th in the afternoon rush (the only time it is congested in any meaningful way). I need to be clear here: they don’t want to remove the trees and green space to accommodate the bus, they want to do it to accommodate the cars allegedly “congested” by the bus – to get the bus out of the cars’ way. As a reason to remove healthy mature trees, this argument is silly. The suggested (and blithely discounted) option is to move the bus stop 100m to the east, where the road expands out to 2 lanes. 100m to the east, where the road expands to accommodate parking. This Google Maps thing is pretty cool. No-one is saying so, but it is clear that the reason this is being discounted is the need to remove two on-street parking spots. The idea that this spot being 100 m further east will “provide incentive to jaywalk” is ridiculous, as there are bus stops across the City that are located 100m from an intersection, and the City is already resistant to calls from the Students at NWSS for a mid-block crosswalk on 8th Ave to alleviate sidewalk congestion on 8th and stop jaywalking. The loss of parking spots is most likely why they can state “We don’t have consensus in the building”. So to reiterate: we are talking about removing greenspace and trees to accommodate occasional parking needs, not to accommodate a bus. In summary, the thinking by the City is wrong here, and this is why we need an Urban Forest Management Strategy, and why we need to change our planning of roadspace to reflect the priorities set by the new Master Transportation Plan. There are often good reasons to remove trees, but none can be found here. Instead, we are given a series of bad planning compromises and post-hoc rationalization that results in the removal of perfectly healthy mature trees. And all the benefits of a healthy tree canopy that were discussed in the Open House? They sound exactly like what Ms. Broad is describing she and her neighbours receive from these trees. The ones the City would not allow them to cut down two years ago. Posted on October 9, 2014 February 6, 2015 . by Patrick Johnstone. Leave a comment. The first phase of doorknocking is over, and phase two begins this week. More importantly, the Candidates are going to start rolling out platforms for your review. I have developed a bunch of policy notes, drawn from my personal experiences, consultation with knowledgeable people from across the City, and two months of knocking on people’s doors. If you click the “issues” tab, you will see the issues, large and small, I will be talking about during this election. These notes will continue to be added to this website with increasing detail as the campaign rolls on. In the meantime, if you have a specific question or concern, please drop me an e-mail, and I would love to have a conversation about your ideas. Posted on October 6, 2014 February 6, 2015 . by Patrick Johnstone. Leave a comment. Yeah, I am depressingly unproductive on this blog these days. Such is the nature of the adventure I am currently on. I simply don’t have time to write when I am out knocking on doors and doing the thousand other little things one must do to run a decent campaign. I also don’t want to write about election stuff here. There are some subtle changes to the Elections Act this go-around, and Municipal Candidates have to have those “Authorized by Financial Agent” statements on all advertising materials. The definition of advertising materials in this digital age is a little fuzzy, but one interpretation is that Blogs, Facebook, and twitter could be interpreted as such if someone thinks you are using it to plead for votes. Therefore, I have a separate Campaign Website (with a bit of a Blog there), a Campaign-only Facebook page, and a Campaign-only Twitter account, all with appropriate “Authorized by…” statements. I’ll do my campaigning over there. That doesn’t stop me from having opinions over here, if I only had time to write about them. One thing I do have an opinion about is the City’s Urban Forest Management Strategy. I have whinged more than once on this Blog about the lack of tree protection in our City. I am glad to see that action is being taken. I could go on length (again) about the benefits of trees in the urban environment. instead I want to talk about the difference one tree made. A good friend of mine lives in a mid-century three-floor walk-up in Brow of the Hill. She lives in a nice south-facing third floor apartment. In the spring, The property owner decided the very healthy century-old tree on the edge of the property was a hassle, and unceremoniously had it chopped down. This decision had a huge effect on my friend’s life. The same tree that dropped leaves on the parking lot of the building also provided shade to her small, top floor apartment. Like most buildings of the era, her home has thin insulation and poor air circulation. In the summer, it sometimes got warm, but the tree kept it tolerable. This year, without the tree, it was stifling for much of the summer. She had to make the hard decision to move, buy an air conditioner, or suffer. With her very modest income, the suffer seemed her only real option, although she is resourceful, and is hoping to get her landlord to paint the roof a reflective colour. If she knew ahead of time, she might have been able to make the case for the tree. This is just one story, but demonstrates that trees are not just nice things to have around, they have a real effect on the livability of our community. New Westminster currently lags behind most Lower Municipalities on tree protection, and this Urban Forest Strategy aims to bring us into more of a leadership position. Although the number of trees per square kilometre in New Westminster is pretty close to our regional neighbours, we lag behind the North American average, and even further behind the optimum level to receive all of the benefits of a healthy urban tree canopy. Unfortunately, we are still currently losing trees faster than they are replaced, and the rate of loss has not slowed even as growth of density in the City has slowed. 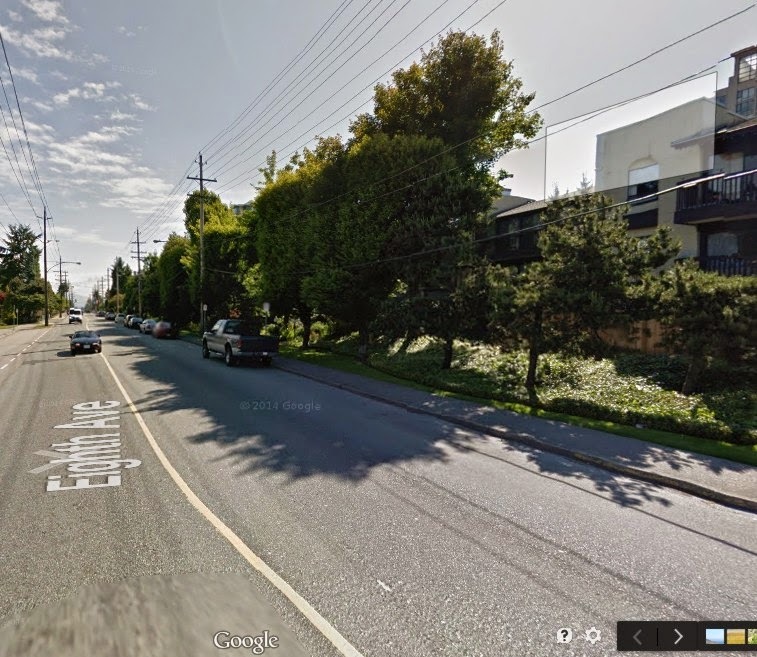 Just in the last 10 years, there has been a 15% decline in the urban forest canopy in New Westminster. It is time for action. What I am most excited about? The City is taking a more comprehensive approach than just slapping a Tree Bylaw in place. A Bylaw may be part of the eventual strategy, but a well-designed Bylaw needs to be supported by a larger strategy if it is going to protect your right to enjoy your residential property, not be costly to implement, and assure that our Urban Forest stops shrinking and starts growing again. It is early times for the strategy, but there will be an open house this Wednesday at Century house in the (apropos) Arbutus Room. It is early times yet, but if you care about trees and the livability of our City, you should show up for an hour and provide your comments and support. There are lots of nice trees nearby Century house you can hug on your way in.